In pictographs we learn to recognize different things in our surroundings and to express the given information through pictorial symbols of different objects. Every government, business organization, department or individual needs some information to review the progress, plans and activities for the future. Even your school principal needs different information to plan for the next session. For example, he/she wants to purchase new furniture for the next session. Naturally, he/she will need information about number of classes, number of students in each class, number of furniture items present, number of new admissions expected, and so on. Such information is always collected in numbers, called numerical data. The collection of information through numerical data is done by many ways such as going individually from place to place and gathering information, collecting information through newspapers, magazines and T.V. etc. or going to a library and consulting reference books, government publications etc. To study the details of data, we use pictures. The study of data through pictures is known as pictorial representation of data. There are different methods of representing numerical data pictorially. One of the methods is to use picture symbols. Such a representation is called a pictograph. Now we will study about representing information by pictographs in more details. What is pictorial representation or pictograph? The expression or illustration regarding the different information about any object or objects or activities through pictures or picture symbols is called pictorial representation or pictograph. (i) The kinds of conveyance used by the students. (ii) The number of students using conveyances and the number of students coming and going on foot. (iii) The number of students using school-bus, own car, bicycle, rickshaw, taxi, etc. (iv) Percentage of students using hired tempo or rickshaw, own car or scooter, cycle etc., fraction of students coming and going without any vehicle. (v) Percentage of students related to rich family. Students having their own cars belong to rich families. Thus, much information may be gathered by studying the pictograph. Ryan, the student of a primary school, collects some information about the number of studying in different class from call I to V.
Represent the data through a pictograph. 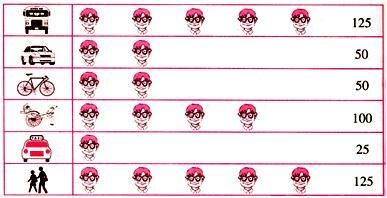 Suppose the symbol of one figure represents 10 students as shown below. The pictograph gives us the following information. 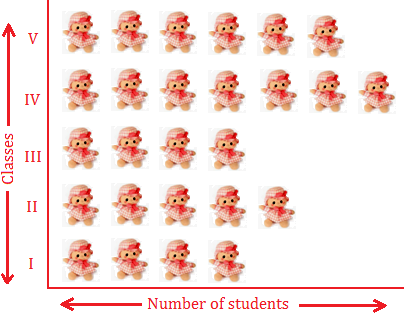 (i) The pictograph shows the number of students in classes I to V.
(ii) The number of students is maximum in class IV. (iii) The number of students is minimum in classes I to III. (iv) The number of students is same in class I to III. (v) The total number of students in the school is 260.